A series of Prints after the work of Francesco Petrarch. A discussion with the director of the Brodsky Center, Rutgers. Experimentation in a new medium. In his assessment of the major shifts in philosophical thinking during the course of the 20th century, the German philosopher Wolfram Hogrebe came up with a succinct summary: “The last century started with consciousness, exhausted itself with language, and ended with the image.”1 This is the age of the image. If they became increasingly prevalent over the last hundred years, they are now ubiquitous across a range of media that could hardly have been imagined a century ago. While old-timers like the present writer nostalgically applaud this very magazine for adding a printed edition to its initial online presence, the fact that daily newspapers are becoming an endangered species is a more telling reflection of current trends. 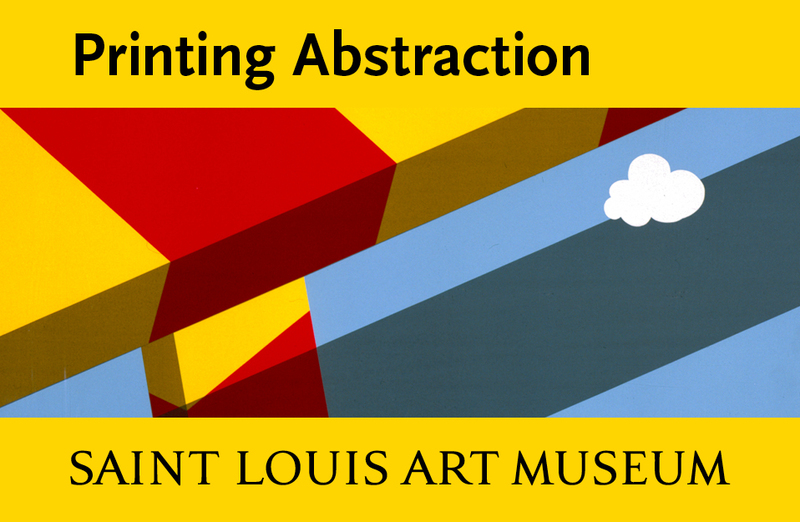 Prints and the Pursuit of Knowledge, the remarkable exhibition organized by Susan Dackerman [see Art in Print, Vol. 2, No. 1] therefore offered a timely investigation into the roots of our visual, informational culture.2 The show’s stupendous catalogue— yes, a book printed on paper and weighing in at 6.5 pounds, half a pound more than four iPads—has been stunningly designed by the Philadelphia-based Purtill Family Business and presents us with a highly important segment of what one might call an archeology of our image-saturated world. In early modern Europe, however, the relationship between visual observation and analytic understanding was undergoing a revolutionary change: the birth of empirical and experiment-based science as we still understand it today. Lorraine Daston’s catalogue essay carefully charts the nature and new utility of observation in this period, noting that while “the library remained (and still remains) as important as the laboratory or the field in the pursuit of natural knowledge,”4 empirical observation came to play an increasingly important role. Fig. 1. Peter Apian and Hans Brosamar, title page of Instrument Buch (1533), woodcut and letterpress, 30.3 x 20.7 cm. Collection of Owen Gingerich, Cambridge MA. Photo: Imaging Department, ©President and Fellows of Harvard College. 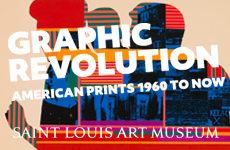 It was William Ivins who first devoted a book-length study to the importance of the printed image for the dissemination of knowledge in his seminal 1953 study Prints and Visual Communication. His claim “that many of the most characteristic ideas and abilities of our western civilization have been intimately related to our skills exactly to repeat pictorial statements” is nothing if not sweeping.7 Ivins’s history of printmaking explained different techniques as a progression toward an increasingly faithful representation of nature. In 1960, Ernst Gombrich’s celebrated book, Art and Illusion, presented a similar narrative—in this case one not restricted to prints—of the development of art in the direction of an ever-closer approximation of reality.8 For Ivins, this trajectory finds its culmination with the invention of photography. He perceives the medium of the print as a syntax that is necessary to translate the artist’s observations into reproducible images. With the advent of photomechanical reproduction the medium loses this role as mediator. First and foremost there is, of course, their materiality and inherent multiplicity, the fact that their templates are infinitely exploitable, that they are printed on paper and often modest in scale and therefore easily transportable. Secondly, prints were accompanied by texts—relief woodcuts with letterpress, or intaglio engravings and etchings with text engraved on the same plate. Thirdly, the matrices could be altered, their contents revised or—as the example of some printed sundials shows—customized for different users. They could be modified and enhanced through the application of color. They could be cut, folded and glued into three-dimensional forms, as was clear from the paper globes and instruments made from modern facsimiles shown in the exhibition. 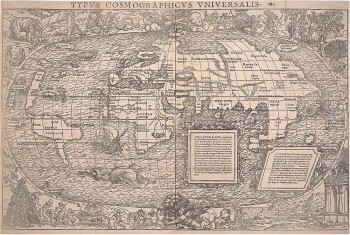 (The catalogue includes a cardstock reproduction of Peter Apian’s Terrestial Globe Gores (cat. 78) which the reader can try out at home.) The disadvantage of their malleable nature, however, is that the survival rate of these prints is incredibly small: the only extant assembled paper instrument is a single astrolabe by Georg Hartmann (cat. 74); another, designed by Cranach, is known from a pre-1945 photograph. Most of the original prints seem to have been used as intended, since even the sheets in their unassembled form are also of the greatest rarity. Suzanne Karr Schmidt might deservedly be called the foremost expert on this aspect of the show. The subject of her dissertation at Yale was “Interactive and Sculptural Printmaking in the Renaissance” (2006); her subsequent position as Andrew W. Mellon Curatorial Fellow at the Art Institute of Chicago resulted in the exhibition and catalogue Altered and Adorned: Using Renaissance Prints in Daily Life in 2011 [see Art in Print, Vol. 1, No. 1]. In this new catalogue, in addition to various entries on individual prints, she contributes an essay on the development of printed instruments in Nuremberg. 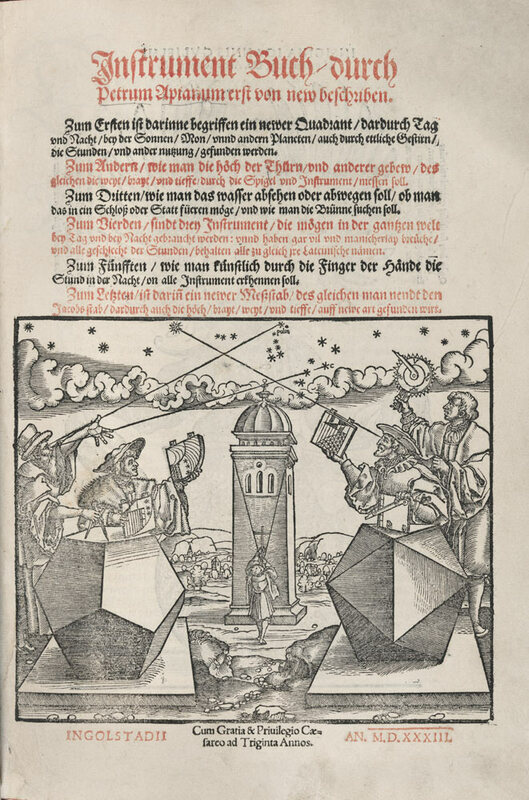 Karr Schmidt’s sleuthing led to some spectacular loans, such as Harmann’s cruciform sundial of 1529 (cat. 68). A complex construction, designed by an unknown artist from the Dürer circle and cut by a highly accomplished Formschneider, it survives on an untrimmed sheet in virtually perfect condition in the Germanisches Nationalmuseum in Nuremberg (it needed to be seen in the exhibition: it is reproduced rather poorly in the catalogue, a rare exception in this otherwise sumptuously illustrated book). Fig. 2. 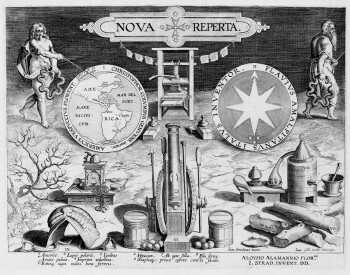 Hans Collaert the Younger, after Stradanus (Jan van der Straet), Title Page of Nova reperta (New inventions and discoveries of modern times) (c. 1599- 1603), engraving, 28 x 34.4 cm. Sarah Campbell Flaffer Foundation, Houston, BF.1998.9.10. While Ivins saw printmaking as moving along a trajectory of ever-increasing naturalism, Dackerman asks whether early modern prints always aimed to represent nature in the most “truthful” way possible, or whether some had alternative ambitions.13 The anatomical lift-the-flap-prints first devised by Heinrich Vogtherr the Elder (cat. 11) are a case in point: made of individually printed elements, pasted in to create individual flaps that can be opened up, they reveal the inner workings of the body and model real surgical examination, rarely performed at that time. The spatial placing of the different layers and the mimicking of the mechanics of a surgical procedure are clearly the main concerns here; as Dackerman rightly points out, to condemn the crudeness of Vogtherr’s design for its pictorial lack of verisimilitude is to misunderstand the prints’ purpose. Fig. 3. 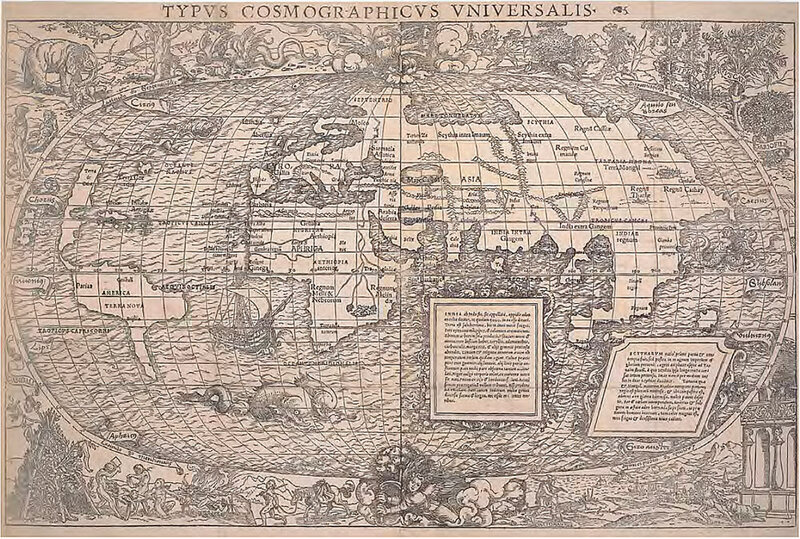 Hans Holbein the Younger and Sebastian Münster, Universal cosmographic map (1532), woodcut from two blocks and letterpress, 35.3 x 55 cm. The British Museum. ©Trustees of the British Museum. The instruments of Peter Apian’s Instrument Buch, published in 1533 with woodcuts by Hans Brosamer (cat. 72) (Fig. 1), offered yet another tactic to access knowledge through print: images that provided not pictures of the natural world but “tools of persuasion … demonstrations and legitimations of the processes of inquiry.”16 Instead of data, the sample instruments and instructions offered readers access to the research methods themselves. 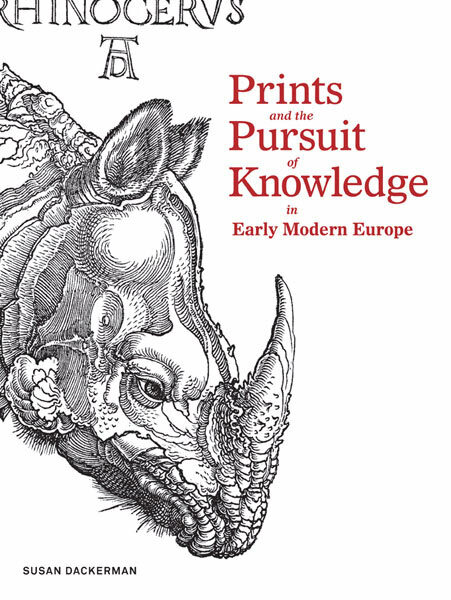 The beautifully relief-stamped image that wraps around the cover of the catalogue shows a detail of the print that in many ways stands at the center of The Pursuit of Knowledge: Dürer’s iconic and enigmatic woodcut of a rhinoceros of 1515 (cat. 35), which received its own chapter here. The animal, the first of its kind to reach Europe since antiquity, came originally from India; it was forwarded by the governor of Portuguese India to King Manuel I of Portugal who regifted it to Pope Leo X. En route to Rome, the ship with the rhinoceros on board stopped in Marseille where it was seen by King Francis I of France. It never reached Italy since the ship sank in a storm off the coast of Italy. 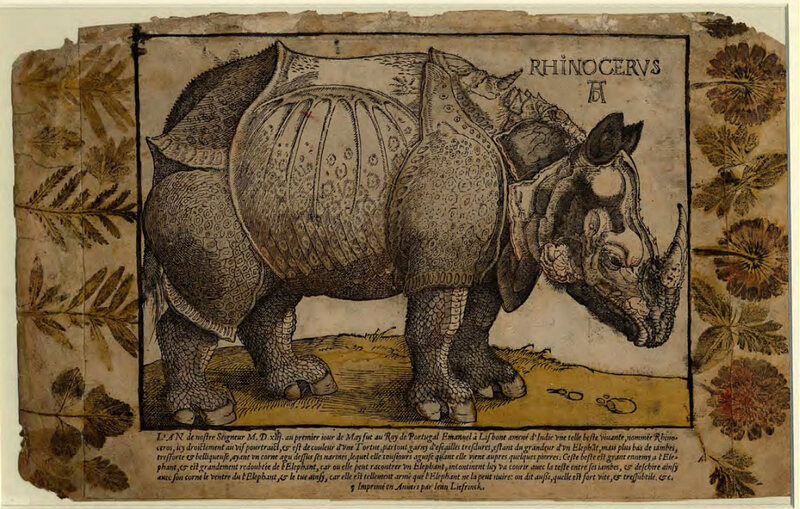 Dürer did not actually see the rhinoceros and probably just knew of it from a description in a Portuguese letter sent to Nuremberg, most likely accompanied by some sort of sketch. From these sources Dürer worked up a highly detailed drawing that became, in turn, the basis for his woodcut. 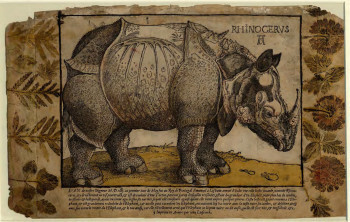 Dürer’s Bildfindung (image invention) came to epitomize 16th-century natural-history illustration, but it is the multiplicity of the print that gave the Rhinoceros its pride of place. Dürer’s Rhinoceros remains the iconic depiction of the animal to this day, despite its peculiar armor plating and dorsal horn. Dackerman’s attempt to reconcile these fictive qualities with Dürer’s genius for specificity leads to my one caveat with this great book and mammoth undertaking. Starting with an impression of an anonymous Flemish woodcut copy of Dürer’s print that was embellished with flowers and leaves printed from inked botanical specimens (cat. 38) (Fig. 4), she proceeds to the semiotic concept of an indexical image (one that is a physical by-product of the thing it represents), and then goes on to speculate that the “textured hardness [of the shells covering the rhinoceros’ body] resonates with the materials of Dürer’s craft—printing plates and woodblocks.”17 She concludes that it constitutes “a deliberate exaggeration of characteristics intended to draw attention to, and thematize, the artist’s printmaking practice.”18 This echoes Joseph Leo Koerner’s musings that the “goldsmith’s son […] Dürer treats the loosely folded skin of the Indian species like embossed sheets of metal.”19 Both writers are attempting to reconstruct the motivation behind Dürer’s willful stylization of the animal, especially since the rigid surface of the animal’s body (described in the accompanying text as “von dicken Schalen uberlegt fast fest”) is very unlike that depicted in Hans Burgkmair the Elder’s woodcut of the same year (cat. 36). Fig. 4. Artist after Albrecht Dürer, printed by Hans Liefrinck the Elder, Rhinoceros (c. 1550), woodcut with hand-coloring, letterpress, and impressed plants, 26.1 x 41.3 cm. The British Museum. ©Trustees of the British Museum. 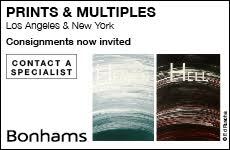 However, instead of decontextualizing the print “as a meditation on printed modes of representation,” I would propose another interpretation. While Dackerman carefully notes the changes between the text inscribed on the preliminary drawing and that of the woodcut, the essence remains the same in both: two-thirds of the text describes not the appearance but the character of the rhinoceros, its cunning, dangerous nature, and the fact that it is the archenemy of the elephant. Could it be that Dürer’s embellishments were artistic means to express what is described as the beast’s terrifying fierceness? If so, it is at least possible that the woodcut is not just a depiction—with plenty of artistic license—of a newly observed exotic species. 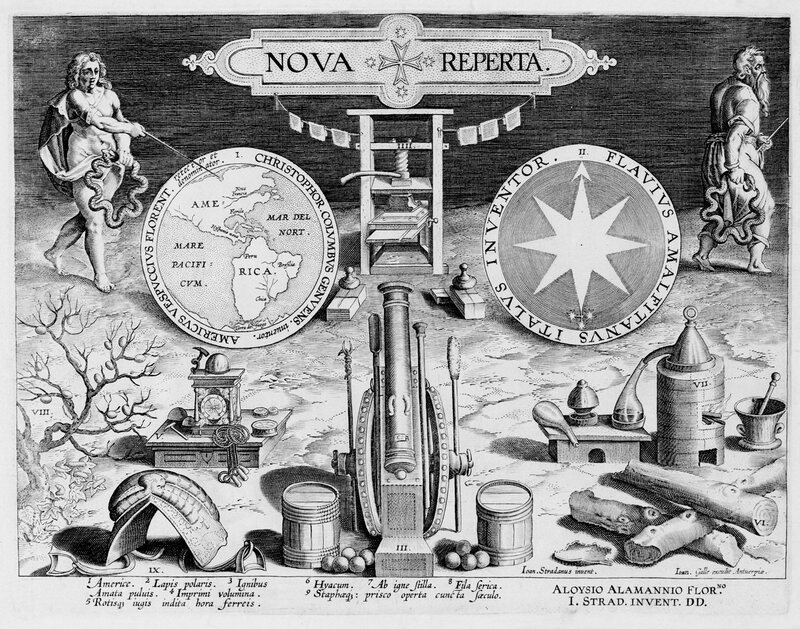 The elaborate exaggerations, together with the text, add a sensationalist aspect to the image, which helps account for the lasting popularity of the print. After all, Burgkmair’s woodcut, which is far closer to reality, survives only as a unicum in the Albertina in Vienna, whereas Dürer’s depiction became the Urbild and model for any depiction of a rhinoceros in European art for centuries to come.